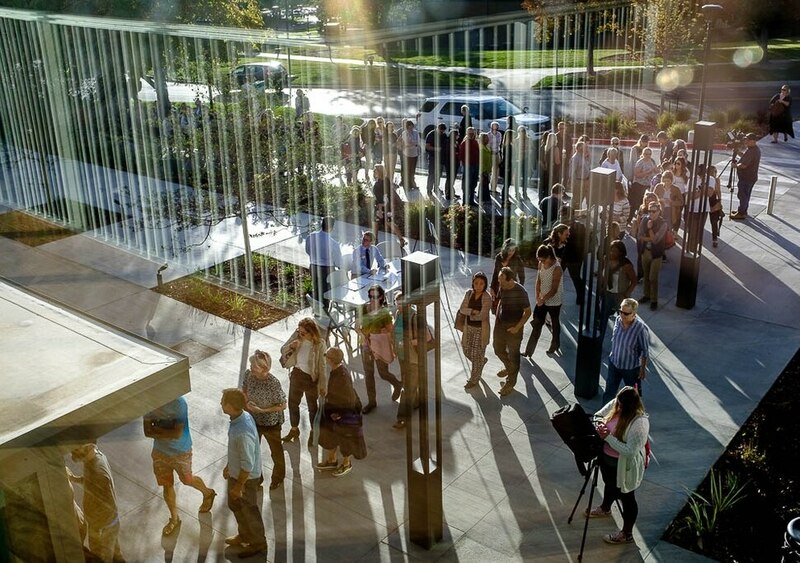 (Trent Nelson | The Salt Lake Tribune) People arrive to hear Anita Hill speak at the University of Utah in Salt Lake City, Wednesday Sept. 26, 2018. 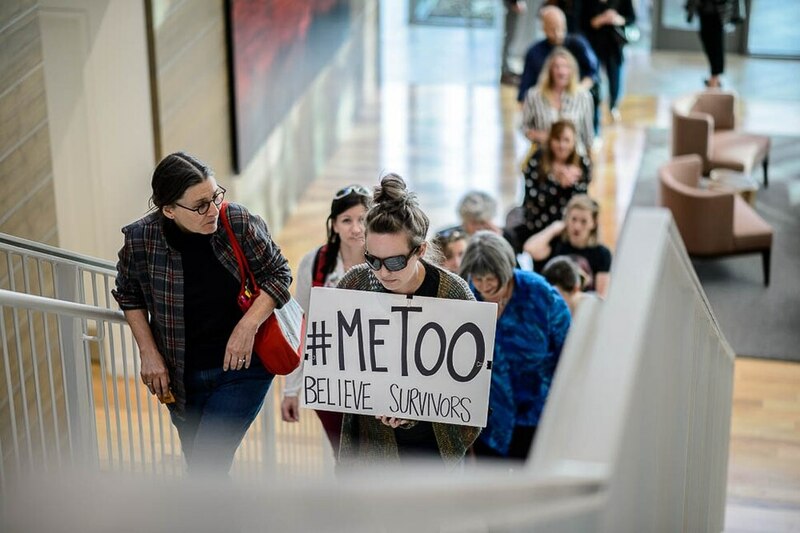 (Trent Nelson | The Salt Lake Tribune) Ashley Weitz carries a #MeToo sign as people arrive to hear Anita Hill speak at the University of Utah in Salt Lake City, Wednesday Sept. 26, 2018. (Trent Nelson | The Salt Lake Tribune) Anita Hill speaks at the University of Utah in Salt Lake City, Wednesday Sept. 26, 2018. (Trent Nelson | The Salt Lake Tribune) Anita Hill speaks at the University of Utah in Salt Lake City, Wednesday Sept. 26, 2018. (Trent Nelson | The Salt Lake Tribune) Anita Hill speaks at the University of Utah in Salt Lake City, Wednesday Sept. 26, 2018. (Trent Nelson | The Salt Lake Tribune) Anita Hill speaks at the University of Utah in Salt Lake City, Wednesday Sept. 26, 2018. (Trent Nelson | The Salt Lake Tribune) Applause as Anita Hill speaks at the University of Utah in Salt Lake City, Wednesday Sept. 26, 2018. (Trent Nelson | The Salt Lake Tribune) Anita Hill speaks at the University of Utah in Salt Lake City, Wednesday Sept. 26, 2018. (Trent Nelson | The Salt Lake Tribune) Anita Hill speaks at the University of Utah in Salt Lake City, Wednesday Sept. 26, 2018. (Trent Nelson | The Salt Lake Tribune) Anita Hill after speaking at the University of Utah in Salt Lake City, Wednesday Sept. 26, 2018. 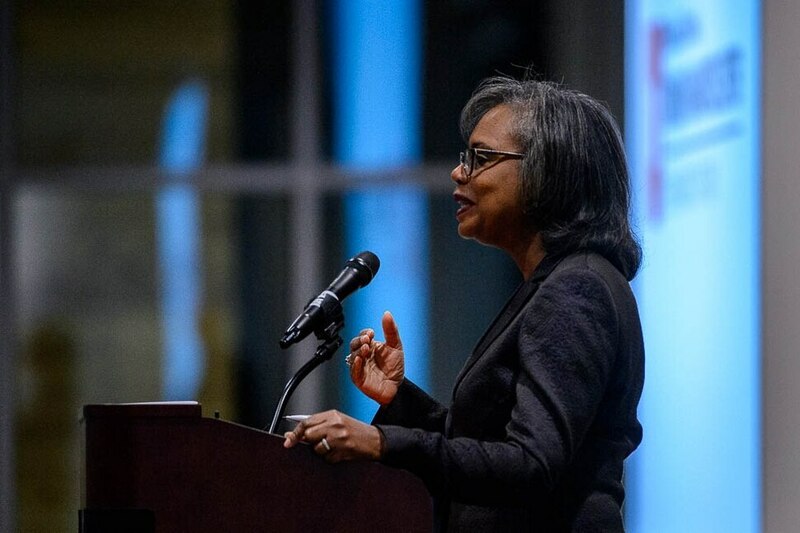 (Trent Nelson | The Salt Lake Tribune) Anita Hill speaks at the University of Utah in Salt Lake City, Wednesday Sept. 26, 2018. One senator told her that she would face “actual harassment” if she didn’t stop talking about her allegations of sexual misconduct. Another called her story “crap.” A third dismissed her as an erotomaniac who believed everyone was in love with her. And Utah Sen. Orrin Hatch, she distinctly recalled, brought a copy of “The Exorcist” to the hearing to suggest she had “somehow plagiarized” her account. Those reactions, Anita Hill told a Salt Lake City audience Wednesday night, have stuck with her in the 27 years since she testified that then-Supreme Court nominee Clarence Thomas sexually harassed her when they had worked together. Now, she said she’s seeing them emerge again as the Senate Judiciary Committee — which still has a handful of the same members, including Hatch — weighs confirming Brett Kavanaugh amid accusations from multiple women that echo Hill’s own experience. Hill spoke about the two parallel cases just hours before the judiciary committee will hear testimony from Kavanaugh and one of the women, Christine Blasey Ford, on Thursday morning. Since then, there have been three more complaints against the nominee regarding sexual misconduct. One woman said that he exposed himself to her during a party when they were freshman at Yale. A second said she had observed Kavanaugh at parties where he and other men gave female attendees alcohol or drugs and then “gang raped” them. Hill said that it would be “inappropriate” to directly compare her experience with Thomas to that of those women with Kavanaugh. But she sees connections in the way politicians have reacted. Hatch, for instance, has said that Ford is “mistaken” in her allegations. Others have criticized Ford for not reporting sooner. Her testimony gripped the nation and divided politicians. But it did not derail the appointment. Thomas, nominated by George H.W. Bush, denied the allegations as “high-tech lynching.” He was confirmed to the bench with a 52-48 vote, the narrowest for a Supreme Court nominee in modern history. He is now an associate justice. Her Wednesday lecture, called “From Social Movement to Social Impact: Ending Sexual Harassment,” also focused on the #MeToo movement that last year sparked a national reckoning over sexual assault and harassment, roiling Hollywood and Capitol Hill, steamrolling a handful of statehouses and continuing to spread beyond. Those in power, she said, continue to have an open pathway to abuse those in lower positions. “Anita Hill was the original ‘me’ of the #MeToo movement,” said Bob Goldberg, director of the Tanner Humanities Center, which hosted the lecture. One woman held a sign that said, “#MeToo Believe Survivors.” Others whistled and cheered when Hill said this is a historic moment with the potential to reshape women’s experiences with misconduct in the workplace. Now, Hill said, it has reached “a human crisis level,” and there is focus on changing how people rise to power, assessing how rampant sexual harassment is and addressing the culture behind it. Maybe, she said, that conversation just hasn’t reached all of the nation’s senators yet.